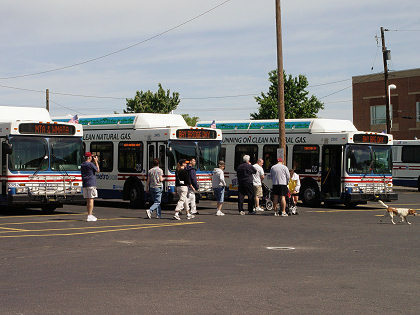 You had to park in one of three lots (two on the western shore, one on the eastern shore), then take a shuttle bus to the eastern end of the bridge where the walk began. Living in Annapolis, I parked in the lot at the Navy Marine Corps Memorial Stadium, conveniently located nearby ($5 parking fee). It wasn't very busy and I walked over to board a bus. Oops! You can't just climb aboard the bus, you first have to go through a security checkpoint (I suppose to make sure you're not carrying any weapons of mass destruction). To simplify security, the rules posted on the internet mentioned that backpacks were prohibited, and that diaper bags had to be see-through. Luckily, we were allowed to wear clothes. The bus ride to the eastern shore was relatively quick, because the buses didn't have to wait in line at the toll plaza (we had our own special lane to bypass most of the heavy traffic). 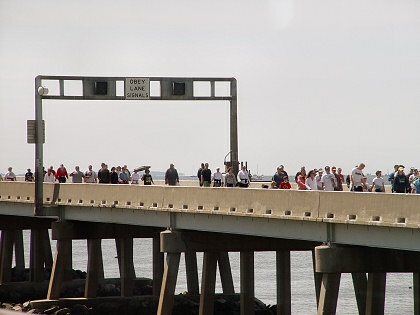 While riding across the northern span, we could see people walking back on the southern span. 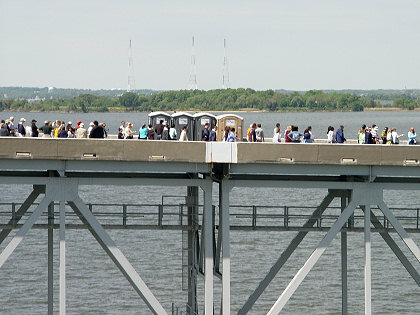 There were porta-potties set up at a number of locations, including on the bridge span itself. It looked funny to see porta-potties occupying a traffic lane on what is normally an extremely busy highway. Walking westbound on the southern span of the Bay Bridge. We actually had to walk across two bridges. The first bridge, which you see coming up in the picture, is a smaller cantilever bridge close to the eastern shore. Later on, we'll walk across the second bridge, which is the big suspension bridge over the main shipping channel. The second bridge gives smaller ships another way to pass under the Bay Bridge. Normally, small boats can pass under the bridge anywhere, since they don't need the very deep water of the main channel or even the secondary channel. 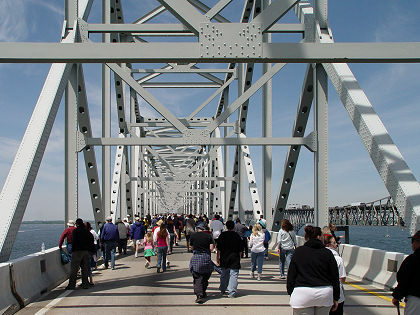 However, during the Bay Bridge Walk, all ships and boats had to pass under the second, cantilever, bridge. For whatever reason, the main channel was closed, as well as the numerous pass-throughs under the trestle spans. There were quite a few police boats and even helicopters patrolling along both sides of the bridge. If a boat tried to pass under any portion of the bridge other than the cantilever bridge, it was intercepted and redirected to the proper place. I couldn't really figure out the reason for all the diversions, but it must have been important because they devoted many people in boats and helicopters to the effort. You can click on this picture to enlarge it; use your browser's "back" command to return here. 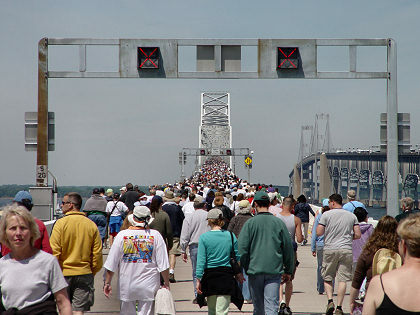 Walking across the cantilever bridge near the eastern shore. As long as you kept walking, everything felt fine. But if you stopped and stood still, you could feel the bridge vibrating and shaking beneath your feet. This was a little unnerving, because I would have thought the bridge would be rock-steady with only pedestrians. It must really shake when heavy trucks go roaring across in traffic. You can click on this picture to enlarge it; use your browser's "back" command to return here.